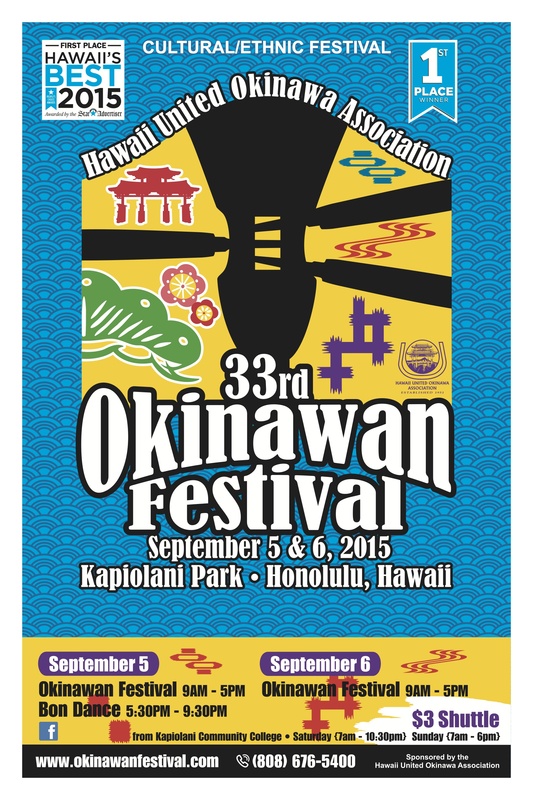 I have only begun attending the Okinawan Festival regularly for the past few years. I am always struck by how joyous everyone is to be sharing and celebrating the uchinanchu culture, in such contrast to all the years I spent ashamed of my hairy arms as my only link to Okinawa. There are always culture tents set up with booths to help people trace their genealogy, learn the Okinawan language, uchinaguchi, (which is very different from Japanese), and understand more about Okinawan dance, emigration to Hawaii, and their history with Japan and WWII. 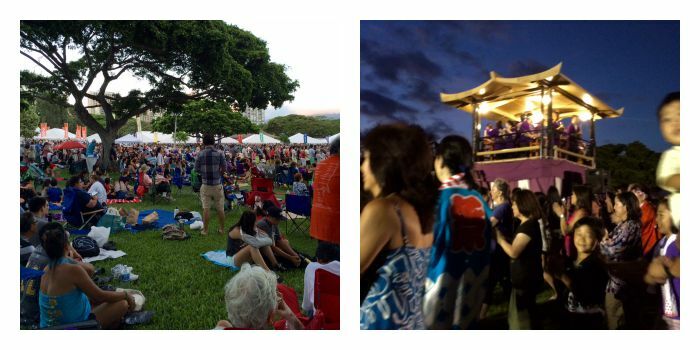 The highlight is always the bon dance, the last of the season on Oahu, which takes place on the grass, accompanied by live musicians, taiko drummers, and the occasional shisa lion dance. L: Look how crowded it was! R: Bon dance at night. From the start, Chebk and I wanted our blog name to reflect our shared Okinawan heritage. It was something that set us apart and bonded us together, but also something I was personally still trying to explore and figure out, which I felt tied in really well to our focus on media representation. I grew up without much to model my Okinawan background on, whether at home or in any kind of media. While there is some overlap with Japanese culture — (Okinawa was a vassal state in the 1600s and formally annexed by the Japanese in the 1800s) — there is something about being able to know and interact with a tangible culture. 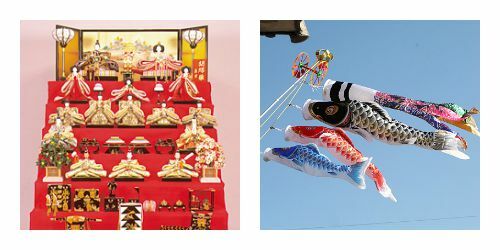 The Okinawan Festival has filled that role for me and, as the crowds there get bigger each year, I hope it fills that role for a lot more local children, Okinawan or not. I can’t say I knew what I was missing in my childhood. My parents worked weird hours so the festival wasn’t really a reliable option. But being at the festival now feels like a reconnection. Whether people attend the festival to appreciate and learn about a new culture or to celebrate their traditions and history, the chance for these things to happen at altogether is very wonderful and I am very appreciative. There are all these cultures and traditions that exist that get pushed to the side (the visibility of my Japanese heritage over any Okinawan traditions in my home) or put into simplified stereotypes (hairy arms; I will never get over this). Mainstream culture gets put on repeat and we appreciate them in different ways, incorporating them into so many other facets of our lives. I hope one day I can incorporate my Okinawan background into my writing as a reflection for myself and others. I don’t know whether I will be able to capture the weight of history behind the shiisa lions, the influence and balance of Chinese, Korean, and Japanese culture on uchinaa culture, or even the unforgettable taste of goya bittermelon. But dancing on a humid night with Chebk, Hoshi, and a crazy amount of people who came to celebrate Okinawan culture, definitely makes me want to try. 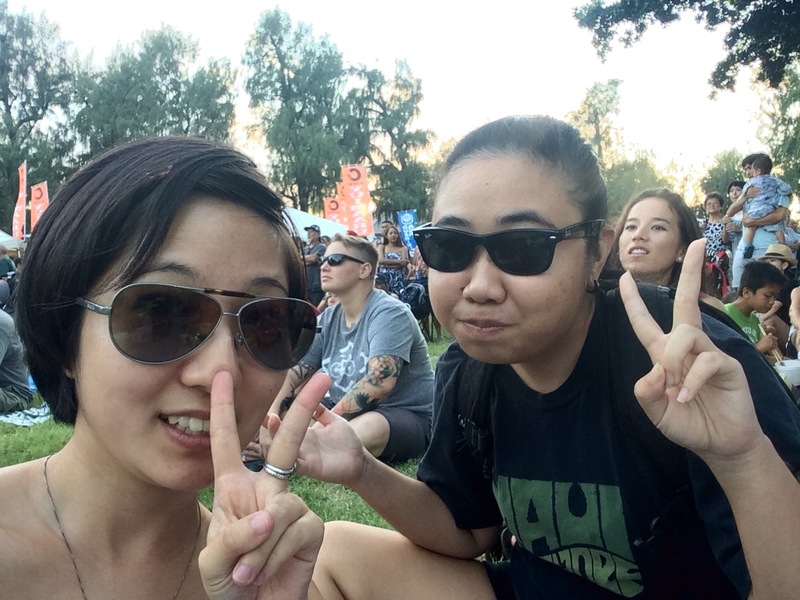 Cheri & Chebk at the Okinawan Festival 2015.